So much so, that the uproar over the height of the statue led to the adjournment of the Legislative Assembly proceedings twice on Friday. CM Devendra Fadnavis refuted the allegations. Nagpur: Opposition leaders, including the leader of the Opposition Radhakrishna Vikhe-Patil and NCP leaders Ajit Pawar and Jayant Patil, alleged that the government was reducing the height of the Chhatrapati Shivaji Maharaj statue in the Arabian Sea even as the government refuted the allegations saying it will be the highest statue in the world. So much so, that the uproar over the height of the statue led to the adjournment of the Legislative Assembly proceedings twice on Friday. Mr Pawar and Mr Patil alleged that the government was reducing the height of the statue from 160m to 126m even as the Gujarat government was constructing a taller statue of Sardar Vallabhbhai Patel. 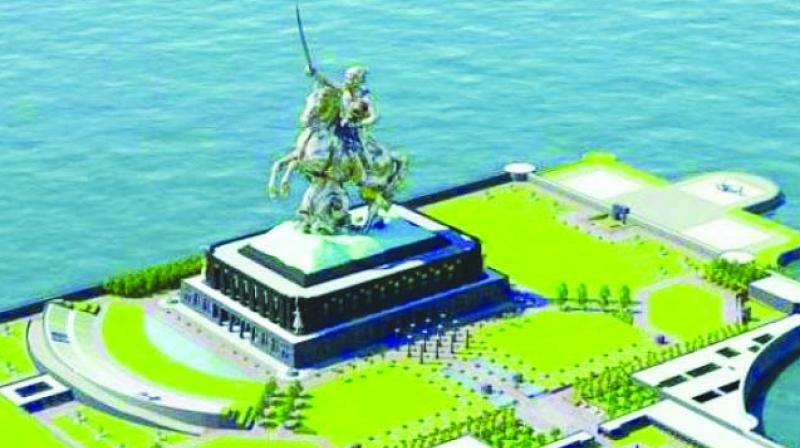 The NCP leaders said that if the Maharashtra government was reducing the height of Shivaji Maharaj’s statue looking at Sardar Patel’s statue, they would not allow it. Mr Vikhe-Patil, too, raised objections and Congress MLA Abdul Sattar stepped in front of speaker Haribhau Bagade and snatched the mace. Mr Bagade slammed Mr Sattar for his misbehaviour.